Being from Toronto, we’re well aware of the relationship between sports and social media. Recent campaigns have rallied around huge success from our beloved teams and gone viral. The Raptors “We The North” and Blue Jays “#ComeTogether” are the most notable. If you didn’t pay much attention to the world of sports beyond this city – you may not know that social media has been a point of controversy in pro sports. There have been a number of social media gaffs that have in some cases caused serious damage to an athlete’s reputation. It’s not all negative though, if used properly – social media can still be a great tool to better connect with your audience. 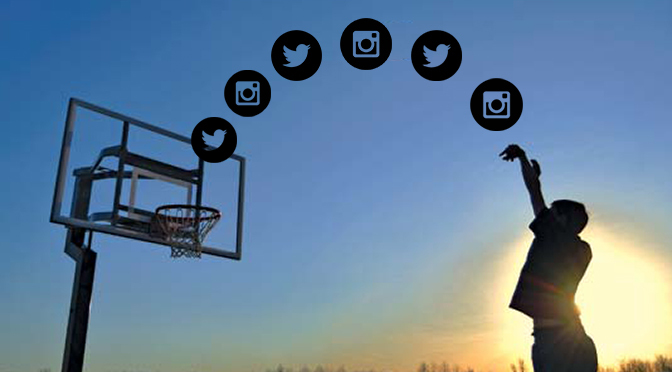 Read on to find out more about the ups and downs of social media in sports. The use of social media by pro athletes provides a difficult dichotomy. Social media gives us (the fans) a new level of access that was previously unheard of. We’re able to look beyond the performances & the interviews and see how these athletes live their lives. There’s a huge demand for this extra content – even if it’s as simple as how they spend a day off or anunexpected warm-up activity. As fans, we worship and celebrate our professional athletes. There’s ALWAYS going to be demand for this content, and the benefit for the athlete is obvious. Increased exposure and influence presents the opportunity for sponsorship, and a larger, more loyal following. The positives are glaringly obvious from the perspective of the fan. For an athlete however, the potential issues are pretty alarming. The same access that provides fans with raw, unfiltered looks into their personal life also provides the athlete with a platform with damaging potential. Social media is 24/7, and if something controversial is posted – there’s sure to be people paying attention. Over the past few years, sports news has been riddled with cases of emotional or unfiltered comments from athletes that landed them in a great deal of trouble. NBA draftee Larry Nance Jr. fell victim to this phenomenon shortly after he was drafted by the L.A Lakers in 2015. Nance had tweeted slanderous comments against Kobe Bryant years prior to the draft. He deleted the tweet, but by then it had been copied and screenshotted by many. Luckily, the oft-controversial NBA star accepted Nance’s apology before they ever saw the court together. In another case, Evander Kane infamously tweeted out this picture at a time where the NHL and NHLPA (NHL Player’s Association) were in an intense legal battle that caused a half-season lockout. The PA were arguing for the fact that the players deserved more money. The picture shows Kane holding stacks of cash up to his ear as if it were a telephone. As a result, Kane was asked by the Winnipeg Jets (his team at the time) to refrain from using social media as often. Both are strong examples, but show how easily a single tweet can translate very differently in a different context. This debate on social media use continues as there seems to be no easy solution. It’s not all dire and desolate for athletes on social media – some have found ways to share great content without inhibiting their personality or damaging their reputation. P.K Subban is a great example. He’s extremely active on social, most notably Twitter. He shares great content like this video which spreads a positive message and still provides the same “inside access” that the fans love. P.K. has also mastered networking with other athletes. In a recent visit to Toronto, he combined with Blue Jays slugger Jose Bautista in a series of tweets and photos. The exchange created a large social media buzz and was featured in a number of news stories. The highlight for me has to be this Instagram video, featuring P.K. having a bit of fun in the Blue Jays clubhouse. What the cases mentioned make clear is that there are very obvious do’s and do-not’s for pro athletes when it comes to social media. Regardless of this, we continue to see them making headlines for careless social media use. The important distinction is that social media is a great tool, but there are many cases when it should be used carefully and with an overarching sense of the context in which your content will and could be viewed. Sharing the Sports Fan: A look at how sports organizations use social platforms to earn a share of sponsor and fan wallets. Also, please feel free to share your favourite athlete social media story in the comments!